Demons of Old Metal hail from Torbay and were forged from the fires of hell in 2010 the band consists of Tombstone Cowboy (vocals, guitar), Babyface Stephens (bass), Psycho Wing (guitar), Dr Doom (Drum) and Digital Death(back up vocals, actions and loops), Although we have our doubts that the band were born with these names. When the band hit the stage, it was apparent the band were aiming for a horror-show/ Halloween aesthetic in a similar vein as Rob Zombie. After a spooky introduction the band fired up their aural assault of their opener "No I am Not Insane", they combine the riffs of Pantera, the pounding drums of Machine Head and the swagger of Hell Yeah to form an intoxicating sound which is both influenced by old school metal and more modern bands. The band kept the interaction with the crowd throughout the performance making sure everyone was enjoying the set. 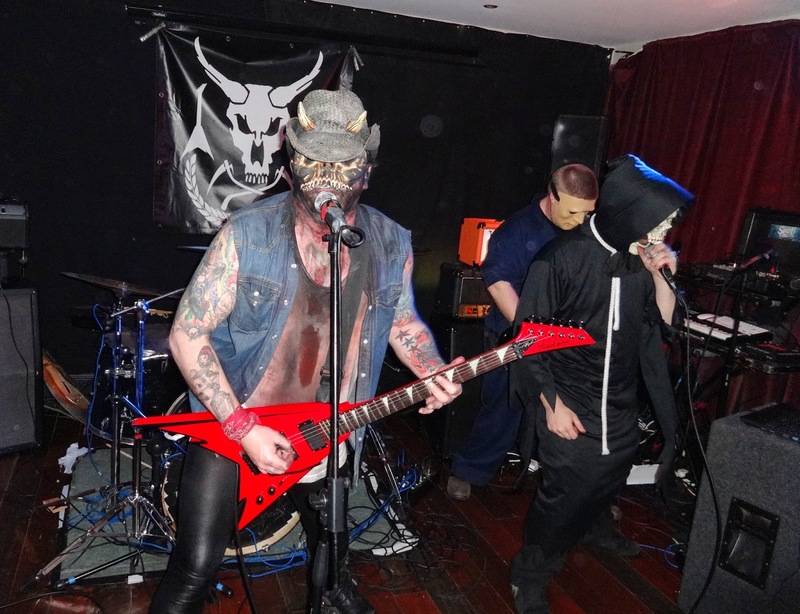 Highlights were "100 Year Crime Spree" a Metallica inspired anthem with a pounding beat and the Machine Head inspired "Psycho Wing" which was the heaviest song they played this night. The band ended on the insanely catchy "Murdercycle" which had actions for the crowd to perform during the chorus . A song so catchy that you will find yourself chanting the chorus days after the gig. The band proved a perfect antidote to the po-faced metalcore bands who take themselves way to seriously that they even believe their inept screaming and generic riffs are art. They effortlessly combined catchy songs with some big riffs and including some amazing guitar technique especially the two handed tapping solos. Definitely a great band to see if you want to hear good music and have a fun night out. The band are set to appear at the The Junction, Mutley, Plymouth on Friday 13th March 2015.